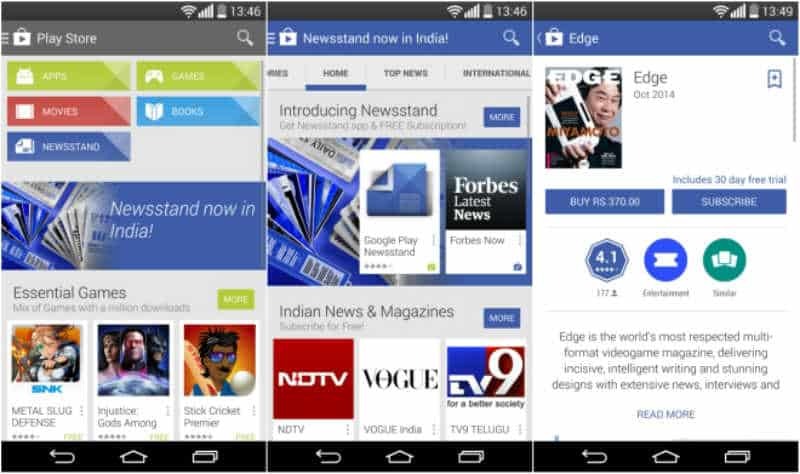 Along with Android One smartphones and providing offline access to YouTube videos, Google also announced paid Play Newsstand content to be live in India, this week. With this service getting live, Android users in India will now be able to subscribe to news sources by going to Play Store on their Android devices or Google Play website. Play Newsstand is actually a news reader from Google that will allow users to read content from various free and paid sources. Until now, users in India were able to consume free content only but going forward they will also be able to buy or subscribe to paid Newsstand content. The service will include 30 publications consisting of leading newspapers and magazines. The publications include Indiatimes, Zigwheels, Luxpresso, Healthmeup, MensXP, iDiva, NDTV Movies, NDTV Gadgets, NDTV Sports, Mid-day, Anandabazar Patrika’s ABP News & ABP Majha, Missmalini.com, HT Media’s Mint, Hindustan Times & Desimartini, Jagran, ESPN Cricinfo and TV9 Telugu. Magazines include India Today, Vogue India, GQ India, Cosmopolitan India and Business Today. In fact, its app that allowed Android users to have access to currents, magazines and newspapers in one place was launched by Google in November last year. For easy reading, articles on Newspaper are formatted differently and users will also be able to save them for later and read them in offline mode as well.